So what else I’m doing these days (and you thought you’d never see anything new on this blog) is studying torah trope. A couple of weeks ago I uncovered a book The Art of Torah Cantillation that I had picked up oh, maybe eight years ago, when the Temple Emanuel choir made a quick trip to a choir festival in the Catskills. Probably it was having relearned the tunes of the wedding blessings a month ago that made me decide to get to work on it, but I read the CD into iTunes and started to practice. In a Jewish Saturday morning synagogue service there’s a reading from the Torah (5 books of Moses) and a reading from the prophets, the way many Christian services will have a lesson from the Old Testament and a lesson from the New Testament; except that firstly, the Jewish readings are much longer, and secondly, the Jewish readings are chanted rather than just read. If you’ve ever gone to a Bar Mitzvah service you’ve probably heard the Bar Mitzvah boy (or Bat Mitzvah girl) chant the reading from the prophets. The chanting is done to a traditional tune, which has an ancient notation written right along the text as little dots and squiggles (in printed Hebrew texts of the Bible — not in the handwritten Torah scroll). The tunes for the Torah are different from those for the prophets (and there are other tunes for other books read in the synagogue, Ruth, Esther, Ecclesiastes, and Lamentations). They function as punctuation and almost an audible diagram of the sentence. That helps a lot in listening, because the Hebrew text itself doesn’t have punctuation except for a mark at the end of each verse. Also, there’s a special tune for the end of each reader’s section — very convenient in the unlikely event that you’ve dozed off or otherwise spaced out during it (or maybe you’re pondering the import of a previous verse), because when you hear it you can wake up in time to be part of the congregation’s response. Maybe a particular mark means “this word starts on the note ‘fa’, and at the syllable with the mark, jump to ‘la’ and stay there to the end of the word.” That kind of thing — short motifs, mostly three notes or so but sometimes a lot longer, that are the building blocks for the whole tune. At one time I was pretty good with the trope for the prophets, but I never learned the Torah trope, much less the tunes for the other books. If you want to see what trope looks and sounds like, check LearnTrope.com I don’t like the voice on that site nearly so well as the recordings that came with my book, and the text in the book has a lot about the whole structure and philosophy of cantillation, so I’m going to stick with the book and iTunes. What that web site does have is pictures of hand signals for the trope, which the book only mentions. 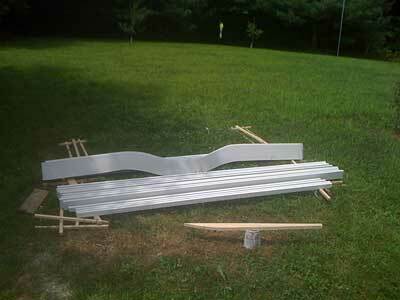 I can show you my garden arbor, looking almost the way it will when it’s finished. It needs more pieces cut and many pieces to be put on, and some finish on the seats (I think I’ll use a clear oil on them, because the paint I used for the rest of it will get chalky and could rub off on dark clothing). All the parts that aren’t there yet are in planes perpendicular to the picture, so they would be barely visible even if they were there; so this is what it looks like! 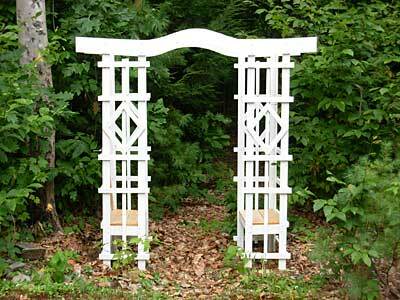 And this is where it’s going to stay, as a sort of gateway into the woods. Hey! I’m pleased with it! On our way home from Portland this morning we heard Hyphenated Blues by the Okratones on WUNH, the campus station from Durham, New Hampshire. It’s about last names. Just listen. I started doing Hebrew calligraphy while I was working at Parke Math Labs in 1978, give or take a year. A born-again woman who worked in the same building said “I just found my name in the Bible, as a heading over a verse in a psalm.” I explained that her name, Beth, was the name of a Hebrew letter, and that psalm had one verse starting with each letter of the alphabet in order. The name of each letter was shown in her Bible as a heading over the verse. She asked me to write the Hebrew letters next to their names. I was embarrassed to find that I didn’t remember how to write them all, so I reviewed the alphabet (or in Hebrew we say alef-bet, for the first two letters, like saying ABC) and really practiced writing for a while. I went to a concert last night, part of the Newburyport Chamber Music Festival, in a renovated carriage house on one of the old sea captain estates along the main road into the town. If the festival hasn’t changed its home page since I set up that link, the picture on the festival web site home page shows another concert in the same space. Early last week a Facebook friend, who has been a knitblog friend for years before Facebook, posted “concert this Friday in my carriage house.” Since I drive past Newburyport on the way to Maine most every Friday, it sounded as though I might be able to get there. There was no trouble finding the address. I had to take a kind of deep breath and walk down the path alongside the immense house towards where the carriage house would be, and then guess where the entrance was. I saw some people standing by the door, a tall woman (matches the description of my blog friend) talking to two men. When she turned in my direction there was no question, and I said, “Hi Julia!” She said “Dean!” and gave me a big hug, then introduced me to the two men, “This is an old blog friend that I’ve never met.” One of the men was the architect for the building renovation, the other, the artistic director of the music festival. The festival web site listed the concert at 6:30, including a reception; so I was only a little worried about being late because of traffic. It took just under two hours from Newton to Newburyport, just about 50 miles and interstate highway all the way, because of rush hour traffic on the route 128 part. I got there at five to seven, and there was plenty of reception left. My supper was cheese and crackers, a slice of quiche, and raw vegetables (I can’t find the e-acute to write crudites properly). I actually spoke to a few people besides Julia. I asked the architect if the white sail things suspended from the ceiling were for acoustics, lighting, or just to break up the space. He said, “you’ve got all three of the reasons they’re there,” and expanded on them. I love it when I can ask something that’s not a dumb question! The musicians were three young women, the Trio Cavatina, playing piano, cello, and violin, joined for one piece by the artistic director of the festival playing the viola. Not just any viola; the piece he played on was by Brahms, and the viola had belonged to a friend of Brahms, who likely had played that piece on that viola when the piece was newly composed. I have mixed feelings about wonderful, special musical instruments. Yes, they are wonderful and special. Playing on an instrument with a history can give the musician a feeling of channeling the other people who have played it and a feeling of participating with the instrument’s maker in producing art. That can undoubtedly add to the quality of the performance. But in the final analysis, it’s what the musician puts into the performance that matters. Two months ago I heard a piece by Yusef Lateef, “Love and Humor”, on the radio; it sounded as though one of the main instruments was a squeaking balloon, but it was fascinating music. I have to say, though, that the instruments the Cavatinas were playing sounded beautiful, and so did the viola. I particularly like a good cello sound, and that’s what we had. I’m sure that Priscilla Lee would sound better on my mom’s cello than I would on Ms. Lee’s cello, and I’m not sure that I could tell the difference between Ms. Lee playing those two instruments. Probably she could tell the difference, and that would make a difference in her performance, and I’d be able to hear that. So I’ll give up and say yes, it’s good for good musicians to have wonderful, special instruments. What I like best about a classical music trio is that I can hear all three parts separately at once. When I’ve played or sung in musical groups with a really good director I’ve been amazed at how the director can hear all the parts at once, not just as a mass of music but as separate parts. You can tell that when the director says, “trombones, you didn’t come in on time,” or “altos, let’s go over your part, I think some of you aren’t sure of the notes.” I still don’t know how an orchestra conductor can keep track of fifteen or twenty different parts. Three is about the most I can do if I concentrate, which I was doing at this concert. I was doing fairly well with the Beethoven piece, though there were lots of times when the violin was near the bottom of its range and the cello was near the top of its and I couldn’t be positive which was which. When the viola joined, I was lost. Four lines is more than I can keep track of. By the intermission I was ready for a bio break. Was there a restroom in the building? I knew who would be able to tell me — I asked the architect. When I was in graduate school I got the notion that I’d like to learn to play “Turkey in the Straw” on the fiddle. Being a starving graduate student, I couldn’t afford to buy a fiddle. Maybe I could make one? While I was thinking about that, I happened to be in the Brookline public library with my roommate (who was from Brookline), and found a book about making violins. As I skimmed it, I saw the caution, “There is no such thing as ‘that’s close enough’ in making a violin! It has to be perfect.” I knew I wasn’t that good a woodworker, and put the book back on the shelf. But right next to it was a book about Appalachian dulcimers. It had a chapter about making dulcimers that said, “Sure! 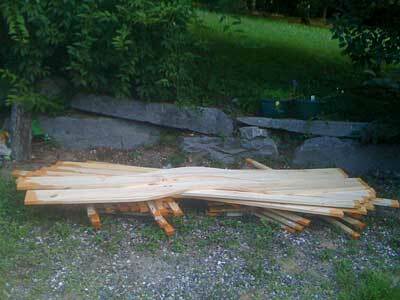 You can build yourself a dulcimer!” So I set about doing that. I think I made five or six dulcimers while I was on that kick. Besides Jean Ritchie’s The Dulcimer Book I got a Folk-Legacy record (vinyl — this was 15 years before CDs were invented) The Mountain Dulcimer – How to make and play it (after a fashion) by Howie Mitchell (I’m amazed that both of those seem still to be available, and that I remembered the names.) Two of those dulcimers looked like the picture on the cover of Ritchie’s book. I sold one in a consignment store in Harvard Square. The other of those, along with a double (courting) dulcimer that’s built as a duet instrument, to be played by two people sitting very close together on opposite sides of the instrument, and a mini dulcimer, sort of along the lines of a backpacking guitar, have been hanging up on our living room wall in Newton for decades. Two others are more primitive, made out of hollow-core doors as Mitchell’s book suggests. I think the instrument I like the best of the ones I’ve made is a balalaika. The neck is made from a piece of wood that was originally bent to be part of the seat of a chair. Either my grad school roommate or I once leaned too far back in the chair and broke it — but the bend of that piece of wood looked perfect for the neck of an instrument. The front is wood from an orange crate. The top of a tin can keeps the strings from cutting into the wood. The frets were once paper clips. Overall, it looks like something a Russian peasant made out of wood left over after his barn burned down. It looks like a proper folk instrument. While I was still in graduate school I used to demonstrate dulcimer, balalaika, guitar, and banjo in elementary schools and do a workshop on making a one-stringed instrument with a piece of wood, plastic milk jug, cotter pin (for the tuning peg – a really really big cotter pin, maybe 3/16 inch diameter) and length of piano wire. You could actually play a tune on those things, with a little work. After a long long hiatus, I started making a cigar-box guitar a few years ago. It’s not finished yet. Besides being designed with a normal set of guitar strings, it has a music box built into the soundboard so that even people who can’t play the guitar will be able to play “Happy Birthday to You” on it by cranking the music box. 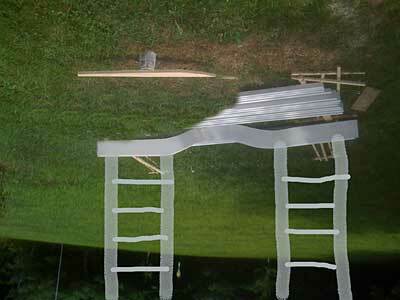 Posted in Uncategorized | Comments Off on Making musical instruments? 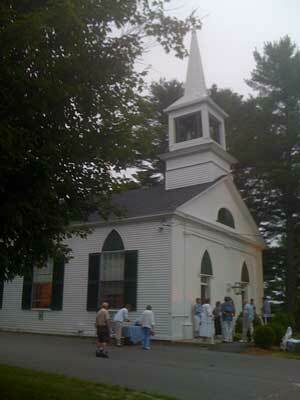 Last weekend (July 24 and 25) we were, uncharacteristically, in two picture-postcard type New England churches. So let’s all go to chapel now! Our chapel here at Williams is beset by many foes. The chaplain is against it, although every week he goes. You didn’t have to go to the college chapel. If you went to some other church service in town, you could hand in a card with your name to an usher, who would deliver the cards to the college so you could be credited. We Jewish students ran our own services on Friday evenings (I led my share of those) and handed in our attendance cards for that; but I liked to go to the college chapel occasionally. This one is a small building, as I probably said last week. 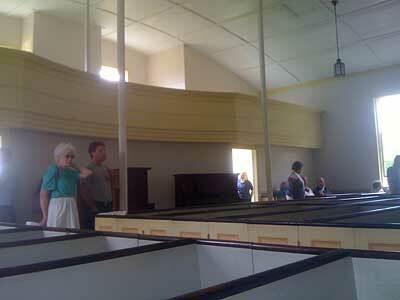 I counted more carefully this time, and got 32 pews that each hold four people comfortably. It’s old enough that it doesn’t have running water; the restrooms are in the community hall, which is a separate building. The concert was by the Denny Breu trio. Denny is one of the best guitarists we’ve run into, and not bad as a songwriter. We’ve heard him three times at the Tom Rowe memorial concerts in Lewiston and once before at Windham. His wife played various flutes — regular soprano C flute, alto, and a Native Americal flute that looked a little like mine but, unlike mine, plays in tune. There was a monster traffic jam on Route 302 when we drove down. We had left in time, we thought, to get some frozen custard (that was supper) and stop at a hardware store for more paint for that arbor; but shortly after the frozen custard the traffic was backed up. I took the side road through Raymond Village, but the traffic was backed up on 121 getting onto 302. I turned around there and took Mill Street over to 35, hoping that the hangup was between 121 and 35, but it wasn’t. We got onto 302, but it wasn’t moving. There was no northbound traffic at all, which made us think the road was completely closed somewhere ahead. Well, of course eventually traffic did start moving. We got to the concert just in time — in fact, with several minutes to spare. We never did find out what happened, but it was probably an accident. Sunday afternoon we went to the Bell Hill Meeting House for the annual service there. This one is more picturesque, though my picture suffers a little from those fluorescent traffic cones. To be fair, the picture of the Windham church would be better if I had taken it with my good camera instead of the iPhone camera and if the lighting were better. But I think this is a particularly graceful building. Bell Hill Meeting House is in Otisfield, four or five miles north of our house. We stumbled across it one day, just “let’s see where that road goes, there might be a ince view from the top of the hill” — and there is, but the building is entirely unexpected up here, far from any town center. In previous years we’ve seen newspaper announcements of an annual service there, but have never had a chance to go. I’ve wanted to see what it’s like inside. This year the paper said there would be an open house and tours from 1 to 3 last Sunday. It also announced a service — but the article about that didn’t have a time or date! We decided to try to get there promptly at 1. There were several cars parked when we got there — other times we’ve driven up there we were the only car — and people were walking to the building carrying three-ring binders that looked suspiciously as if they held choir music. The service was going to be that day, at 2:30, and the choir was rehearsing in between. We explored the area a little in the hour and a half we had. 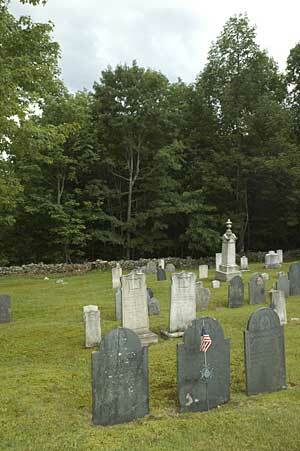 First, we looked around the cemetery across the road. Most of the stones dated from the late 1800s. We walked a couple of hundred yards down the road, and then took a right on Peaco Hill Road, just because we had never driven down it. There was a gorgeous view from the side of it; maybe not as impressive as the view from Hacker’s Hill in Casco, but maybe. 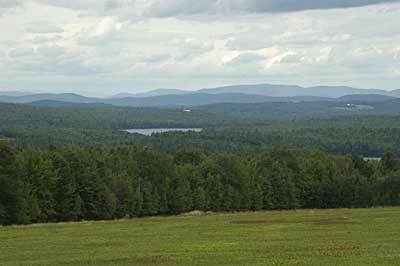 It’s certainly not like scenery in the West, but for New England this is very impressive. 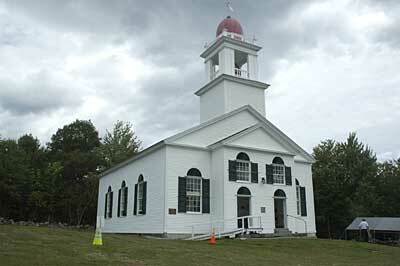 It turns out that in 1837, when the meetinghouse was built, Bell Hill was the center of Otisfield. 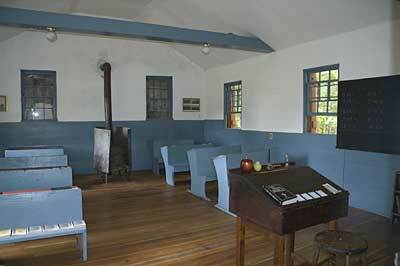 There’s a brick one room schoolhouse, which was also open for the afternoon, next to the meeting house. Someone was going to reenact classes there later in the afternoon. We just poked in. I wasn’t all that interested in seeing a lesson, because my sisters and I had spent a real school day at a one room school in Vermont one fall when we were kids — it was probably in 1955 plus or minus two years. We did notice that the desks are different sizes, smaller towards the front so the younger kids can see the blackboard. 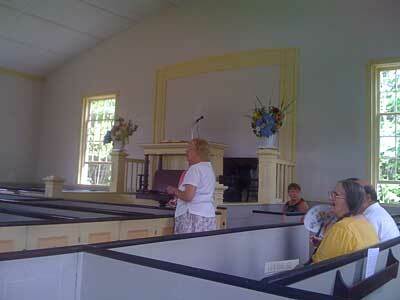 I took a couple of pictures inside the meeting house after the choir rehearsal and before things really started. First, looking toward the front. The flowers are all from a local garden. 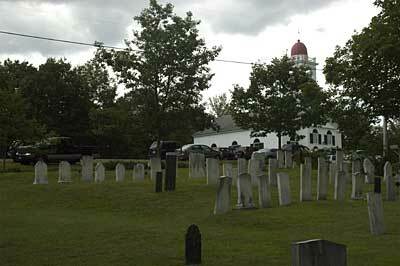 Then, looking toward the back. The pillars were added after lightning struck the tower and weakened several posts that held up the bell tower. Besides some prayers and hymns (but no lessons from scripture) the service included a brief history of the church in the form of an imagined letter from a town resident in the 1840s to her sister, read by the woman who was going to re-enact the one room school class, and a talk about recent structural repairs to the building, by a local barnwright who does timber framing and other structural work. He said he had done long-term temporary repairs to the building, by which he meant they weren’t permanent repairs, which under historical preservation guidelines would have to be with materials similar to the original, but structural steel added in such a way that it could be removed, but that should last for a good 100 years. 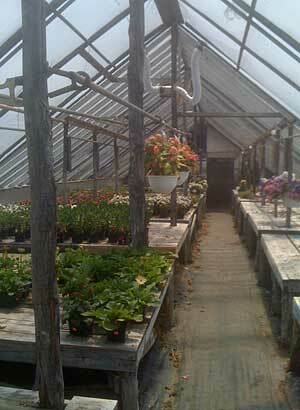 Our favorite place to buy garden plants in Maine recently has been Reinhart’s garden center in Naples. They’re not on a main road, so it took us a while to find them. I guess Arlene saw their ad in the local newspaper once and wanted to check them out. At any rate, they have a big selection of annuals and vegetables, when they’re open. They don’t open in the spring until Mother’s Day weekend, and only stay open through about the first half of July. I guess they figure that anything they don’t sell by then just isn’t going to sell, and it’s not worth having someone mind the store for the small amount of business they would do later in the year. 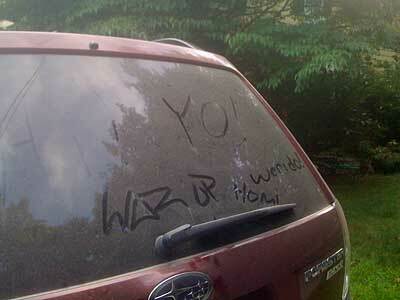 About a week ago I noticed that the rear window of our new car sported some graffiti. It must have been done by someone who spends less time on gravel roads than I do and doesn’t appreciate the futility of keeping a car washed if you do travel on gravel roads. Posted in Uncategorized | Comments Off on Werido? You are currently browsing the Rolling On One weblog archives.